In order to understand Ecuador's current strategy to combat illegal fishing, we must first look back to its origins. The Galapagos Islands and their surrounding waters encompass a truly unique ocean environment that has spawned amazing creatures ranging from the marine iguana, to the Galapagos penguin to the fabled Darwin finches. The upwelling of the cold, nutrient-rich water of the Humboldt Current supports the concentration and reproduction of migratory marine species ranging from humpback whales, sea turtles, giant manta rays to shoals of hammerhead sharks all meriting our best efforts in their protection. In 1998, faced with mounting threats, the Ecuadorian government enacted the Special Law to establish sustainable growth parameters for the Archipelago. The legislation established the 133,000 sq. km Galapagos Marine Reserve - equal to the size of New York State - and also set up the legal framework requiring joint patrols by two unexpected and non-traditional allies: the Navy and the Galapagos National Park Service (GNPS). The arrangement melded Naval power of arrest and firepower with GNPS patrol vessels and environmental expertise. In practical terms, this meant the sharing of boats, expenses and defining clear roles and responsibilities based on respective jurisdictions. Despite their differences, the two institutions learned to work together resulting in numerous seizures over the years. Their collaboration did not stop with traditional patrols. 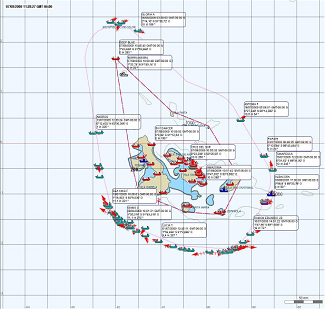 In 2009, they established joint control centers and deployed satellite vessel monitoring transceivers aboard all vessels of 20 gross tons to stop illegal fishing of the national commercial fleet. 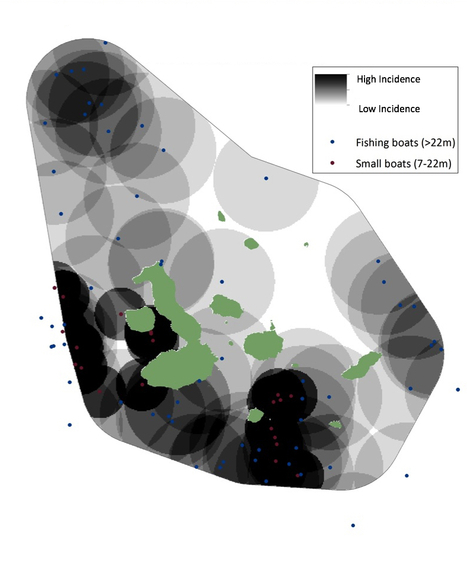 The technology enabled the institutions to track commercial vessels on an hourly basis and determine whether a vessel was fishing or not just by viewing the tracks. Importantly, the authorities have also been able to anticipate where future illegal fishing may take place and deploy limited resources over "key high incidence areas." While no system is perfect, it is clear that the close collaboration of the Navy and GNPS has been highly impactful and the use of electronic monitoring systems has resulted in more cost effective enforcement of fishery and environmental laws. Fast forward to 2015, and the framework still holds true. Based on its success, the Navy and Environmental authority now are replicating the model and scaling it to strengthen the enforcement of Ecuador's 17 coastal marine protected areas (MPAs). The Naval and Environmental authorities will share data generated by electronic monitoring systems that include high power video cameras, radars and soon to include a countrywide mandate for the use of Automatic Identification System (AIS) transceivers aboard all vessels irrespective of size. This will be critical for the monitoring of over 11,000 artisanal vessels that fish along its coastline. In a not too distant future, Ecuador will have nearly 100% maritime surveillance coverage including response capacity for its coastal waters; something that many would have thought inconceivable just a decade ago. Much work remains to be completed and fishing pressures are forever increasing, but Ecuador is demonstrating that it has the political will to prioritize investment in ocean conservation. Its leaders are already adapting by using innovative inter-institutional arrangements to work within financial constraints for the more effective application of regulations. As more and more Navies repurpose their assets and broaden their mandate to include environmental stewardship, illegal fishing, especially foreign incursions upon sovereign waters, will become more difficult. Ecuador has also begun looking beyond its borders to share experiences and models with other countries including Costa Rica and Mexico. Since well-funded illegal fishing interests do not respect borders, meaningful collaboration among countries is more critical than ever. Looking forward, enforcement models will continue to evolve in tandem with technological innovations, but more importantly, a greater shift towards action based on political will, inter-institutional collaboration and systematic training will be needed to stamp out illegal fishing and improve management of fisheries worldwide. Marcel Bigue currently leads WildAid's international marine program out of San Francisco. Having worked in varying capacities in nine countries over the past 16 years, he's focused on the strategic design and implementation of complex development and marine conservation programs. Since 2000, WildAid and partner Conservation International have worked with the GNPS and Navy to deploy surveillance technologies, improve patrolling and vessel maintenance processes, introduce sniffer dogs to detect the trafficking of shark fins, and the prosecution of illegal fishers.